The 7.65×21mm Parabellum (designated as the 7,65 Parabellum by the C.I.P. and also known as .30 Luger and 7.65mm Luger) is a pistol cartridge that was introduced in 1898 by German arms manufacturer Deutsche Waffen und Munitionsfabriken (DWM) for their new Pistol Parabellum. The primary designers were firearms designers Georg Luger and Hugo Borchardt, who developed the round from the earlier 7.65×25mm Borchardt while working at DWM. In 1897, the C-93 Borchardt pistol was submitted for testing to the Swiss Military Trials Committee. The Committee found the Borchardt too heavy and unwieldy to serve as a military sidearm. Georg Luger was tasked by DWM with improving upon the Borchardt pistol. He developed the 7.65×21mm Parabellum cartridge from the 7.65×25mm Borchardt. By shortening the cartridge case, Luger was able to design a narrower grip, and the toggle action required a shorter stroke than in the original Borchardt design. A transitional Borchardt-Luger model in the new caliber was submitted to the Swiss commission in 1898. After further improvements, the final result became the DWM Pistole-Parabellum ("Luger pistol"). The loading for the new cartridge was standardized and mass production began in 1900–1901 in DWM's factory in Karlsruhe, Germany. Around 1903, a separate load was developed for Parabellum carbines, with approximately 20% more powder (increased from the standard 0.32–0.35 g to 0.4 g) and a blackened cartridge case. This carbine load was manufactured until sometime after World War I. Since its introduction, 7.65×21mm Parabellum ammunition has been manufactured in several countries for both domestic use and for export, including Germany, Switzerland, Finland, France, Portugal, Brazil, the United Kingdom and the United States. With the adoption of the Luger Parabellum Model 1900 pistol in 1900, the 7.65mm Luger became the standard pistol cartridge of the Swiss Army until the late 1940s. The later sidearm of the Swiss military, the SIG P210, was also manufactured in this caliber, but only for civilian use; Swiss military issues of the P210 were chambered in 9×19mm Parabellum. The 7.65mm Parabellum was replaced by the German Army with the 9×19mm Parabellum cartridge. This involved simply expanding the bottleneck of the 7.65mm Luger cartridge to accept a 9mm bullet. Due to the almost identical case width, rim width, and overall length of the cartridges, most 7.65mm Parabellum firearms can be converted to 9mm Parabellum, and vice versa, with only a change of barrel. The Luger pistol in 7.65mm was adopted by the Finnish in 1923 with the designation Parabellum Pistooli 23, abbreviated m/23. About 8000 pistols were delivered, but few survived the war. Many of these pistols were rebarreled to 9mm, and a limited quantity remained in storage until 1980 for arming non-combat personnel. The Finnish Lahti L-35 pistol, a 1929 design introduced in 1935 to replace the Luger pistol, was also originally chambered in 7.65mm Parabellum before it too was switched over to the 9mm Parabellum. Around 1900, Brazilian armed forces adopted the round for use in German-made Parabellum pistols (partially replacing the Simson Nagant-style revolver) and, later, in some Schmeisser MP-28 II submachine guns made in Belgium under license. It remained in limited use by some police forces up through the 1970s, such as the former Guanabara State Police (based in Rio de Janeiro). In addition to the Luger Parabellum and the SIG P210, several other handguns have been manufactured in this caliber, mainly for commercial sale in countries that restrict civilian use of contemporary military calibers such as 9mm Parabellum. Examples include the Astra A-80, Benelli B80, Beretta M952, Beretta 92, Walther P38 and P38K (K in this caliber = very rare), Browning Hi-Power, Mamba, some models of the Ruger P series and the SIG Sauer P220. A handful of submachine guns have been manufactured in this caliber, notably the SIG Bergmann 1920 (the licensed Swiss version of the Bergmann MP-18/1), the Swiss Furrer submachine gun and its double-barreled aerial counterpart the Flieger-Doppelpistole 1919, the M/Neuhausen MKMS, the Austrian MP34 and the Suomi M-26. The name is derived from the Latin phrase si vis pacem, para bellum—"If you want peace, prepare for war." The 7.65×21mm Parabellum has 0.93 ml (14.3 grains H2O) cartridge case capacity. 7.65×21mm Parabellum maximum C.I.P. cartridge dimensions. All sizes in millimeters (mm). 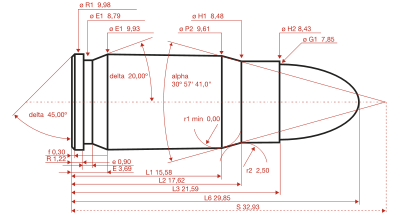 The common rifling twist rate for this cartridge is 275 mm (1 in 10.83 in), 4 grooves, ø lands = 7.62 mm, ø grooves = 7.83 mm, land width = 3.05 mm and the primer type is small pistol. This cartridge headspaces on the shoulder of the case. According to the official C.I.P. (Commission internationale permanente pour l'épreuve des armes à feu portatives) guidelines the 7.65×21mm Parabellum case can handle up to 235 MPa (34,100 psi) piezo pressure. In C.I.P. regulated countries every pistol cartridge combo has to be proofed at 130% of this maximum C.I.P. pressure to certify for sale to consumers. ^ Wilson, R. K. Textbook of Automatic Pistols, p. 244. Plantersville, SC: Small Arms Technical Publishing Company, 1943. Barnes, Frank C. (1972). Cartridges of the World, 3rd Edition. Digest Books, pp. 153, 177. ISBN 0-695-80326-3. Goertz, Joachim and Sturgess, Geoffrey (2010 and 2011). The Borchardt & Luger Automatic Pistols. Brad Simpson Publishing and G.L. Sturgess. pp. 1455–69. ISBN 978-0-9727815-8-9. Wikimedia Commons has media related to 7.65x21mm Parabellum.